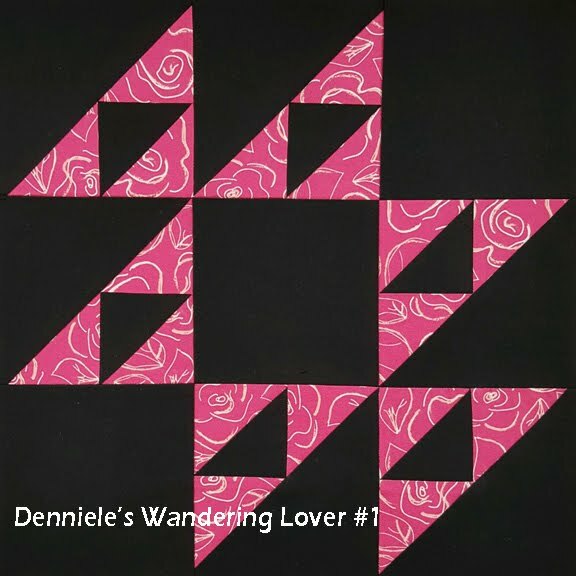 Order Number Eleven was named for a Union order forcing Southern sympathizers to leave their homes. 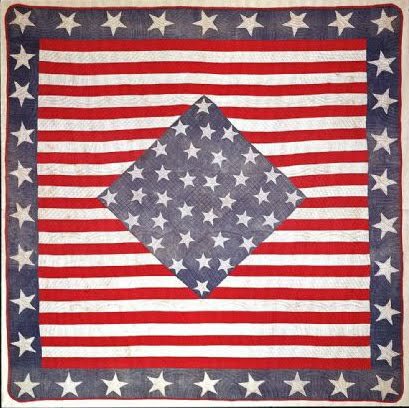 The quilt design Order Number 11 was published in the Kansas City Star in 1929 by Ruby Short McKim, a pattern designer from Independence, Missouri. 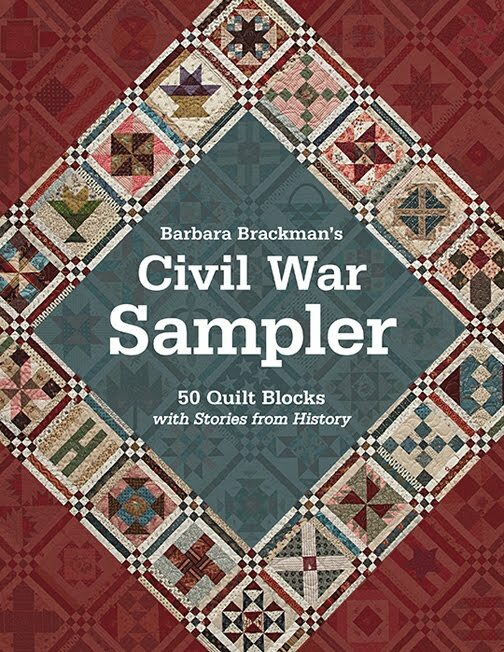 She told the story of Fannie Kreeger Haller who as a ten-year-old, "saw her mother's choice new quilt snatched from their bed by marauders back in 18when Order No. 11 was the issue. 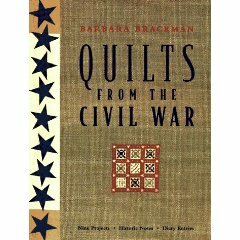 She carried the treasured design in her mind and years after reproduced the quilt, christening it 'Order No. 11'." Detail of George Caleb Bingham's painting Martial Law or Order #11. Is that a quilt being stolen on the balcony? 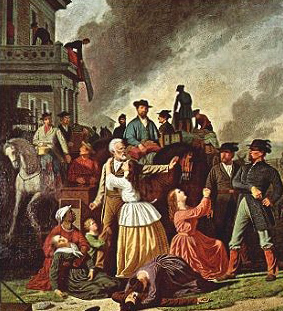 This dramatic painting by Mattie Bingham's husband is one reason the story of Order #11 lives on. See Mattie's story in Block#19. Even sixty-five years later, McKim's readers would have been quite familiar with the issue of Order Number 11. In 1863 Missouri Bushwhackers under the control of William Quantrill burned the pro-Union town of Lawrence, Kansas, the home of the Jayhawkers. Quantrill's raiders murdered every man and boy they could find, killing nearly 200. Four days later the Federal Army issued the order evacuating four counties in western Missouri in what could be seen as either a wise precaution or a vicious act of revenge. 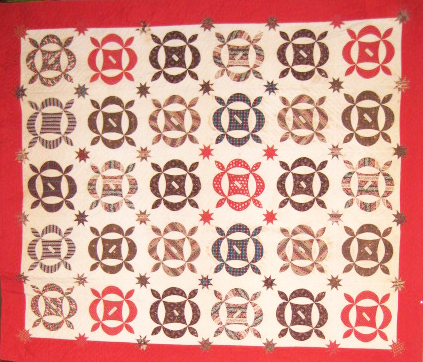 Fannie's mother's quilt, which was jayhawked right off the bed, was of the design also known as Hickory Leaf or the Reel, a pattern that dates back to the 1840s. 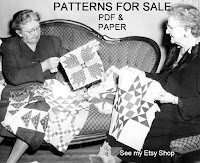 The early versions were sometimes pieced but most are applique. 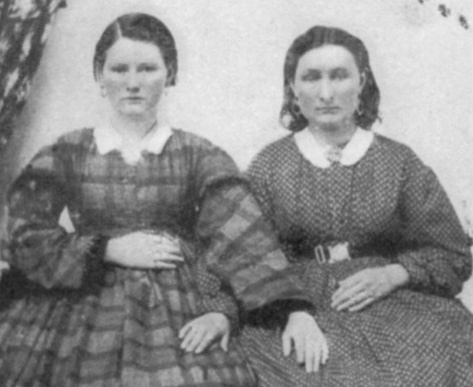 Sisters-in-law Nannie and Charity were Confederate sympathizers who aided Missouri guerilla Bushwhackers and were imprisoned in Kansas City. The jail fell down killing Charity and three other women, one in a series of heartbreaking events that led to Order Number 11. Cut a square 8-1/2" of background fabric. 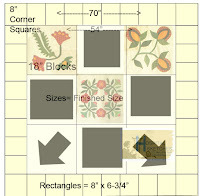 Use the templates in the PDF file to cut the applique pieces. Add a scant 1/4" seam allowance to the pieces. 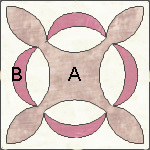 You need 1 of the large piece A and 4 of the crescent B. 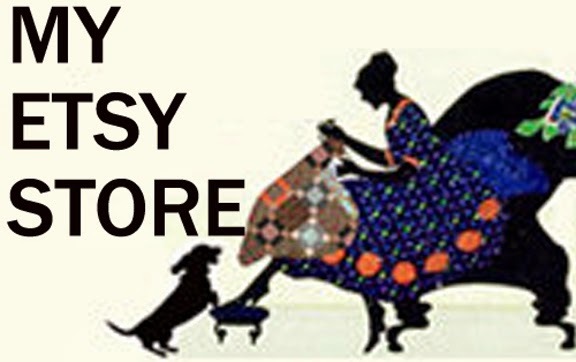 Prepare and applique in your favorite manner. Remember if the PDF prints out the wrong size you can adjust the size when you are giving your printer instructions. If it's too big--- try printing it at 50% and see how it looks in the preview. 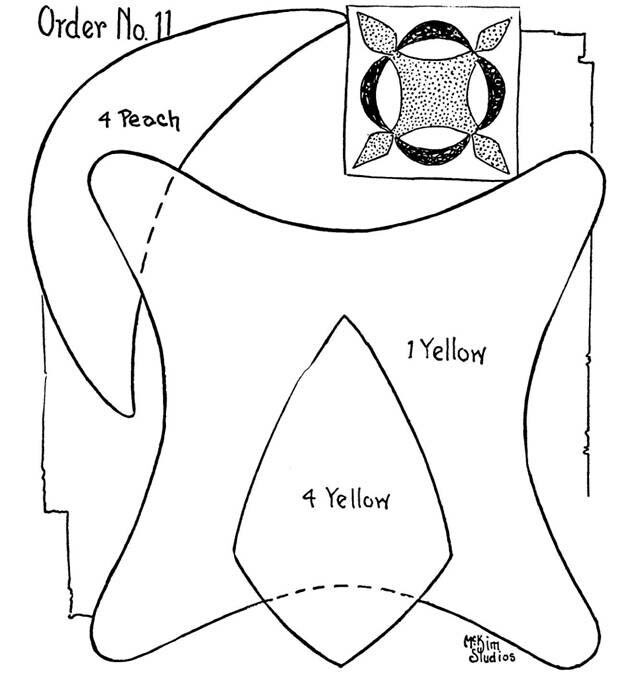 Adjust the percentage until the block fits within the margins of an 8-1/2 x 11" piece of paper. It should then fit fine in your 8" block. 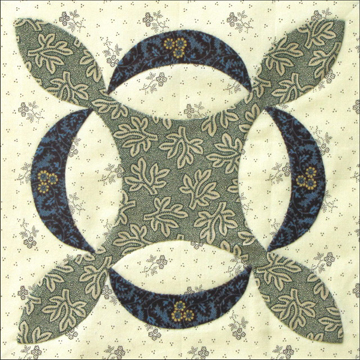 Another way to do this pattern is to applique the whole figure as one piece. 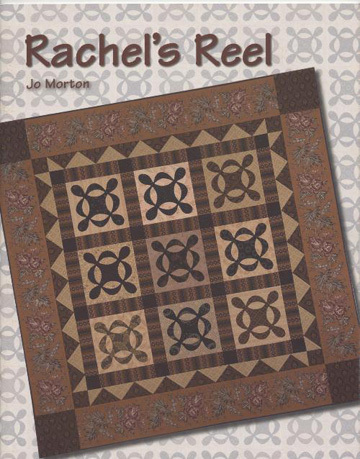 See Jo Morton's popular pattern "Rachel's Reel" for a similar design with a single applique patch that fits into an 8" square. 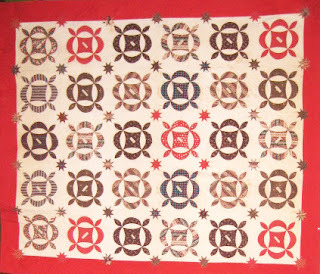 The Reel design is one of the classic patchwork patterns from before the Civil War. Here it's been modified with a white signature strip across each block. 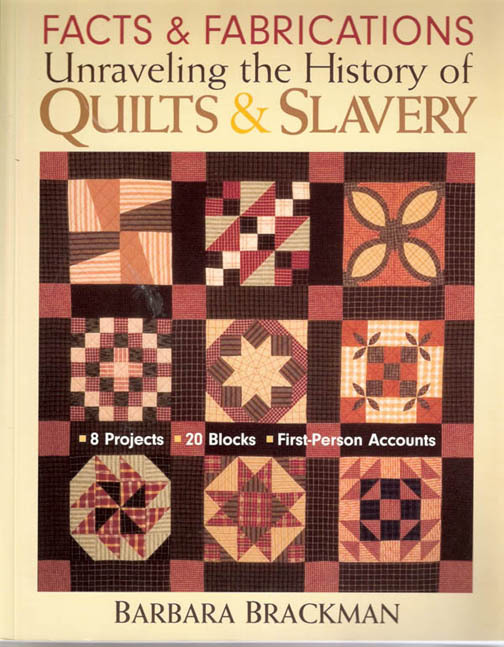 The quilt (probably about 1850) was advertised as a New Jersey quilt in an online auction. 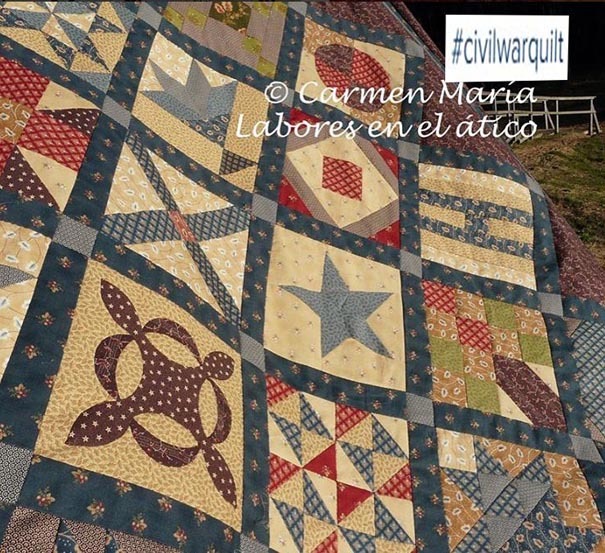 nice to read the story...but hard to applique this block...I think this needs me time the whole week. I printed it and it was BIG and only a 1/4th of the pattern. Glad I could find it in Blockbase # 3110 -5 pages of templates...oh my! Beautiful block. 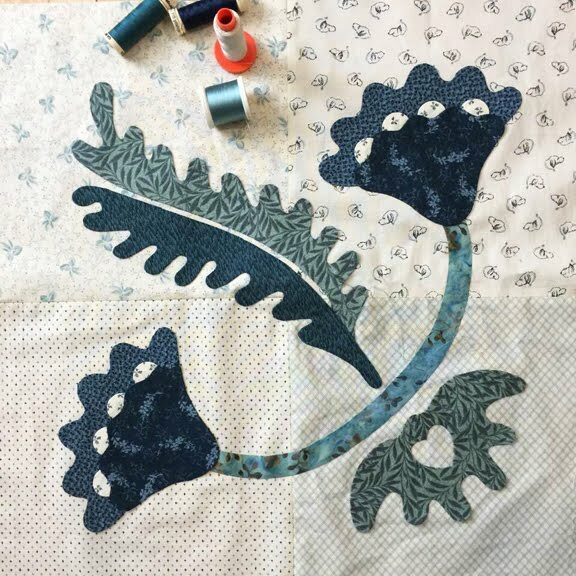 I love applique, and had no idea we'd be doing something so pretty. Thank you for the work you put into this project. I can only imagine how much you love history! I found this very interesting. 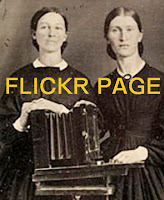 My great great grandparents were some who were forced to leave their home. My great great grandmother was literally thrown out into the snow, with a baby in her arms, and she had to beg for a tablecloth to wrap her baby up in. 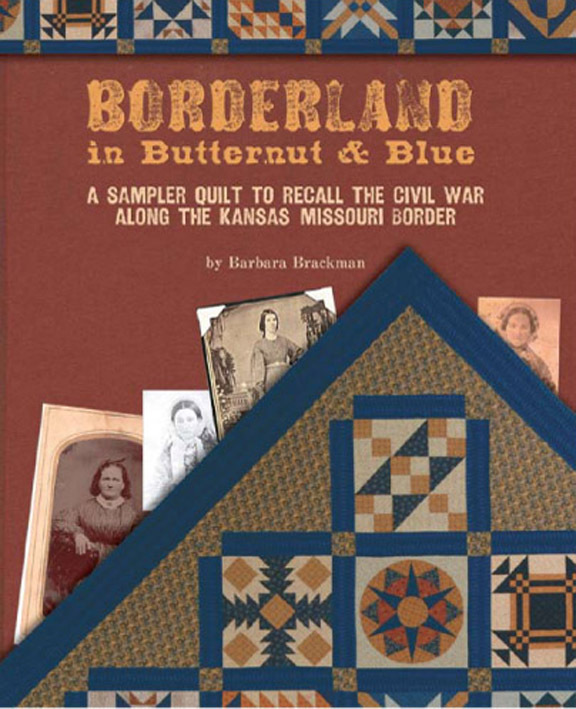 They fled to an island in the middle of the Missouri river and lived there until after the war. 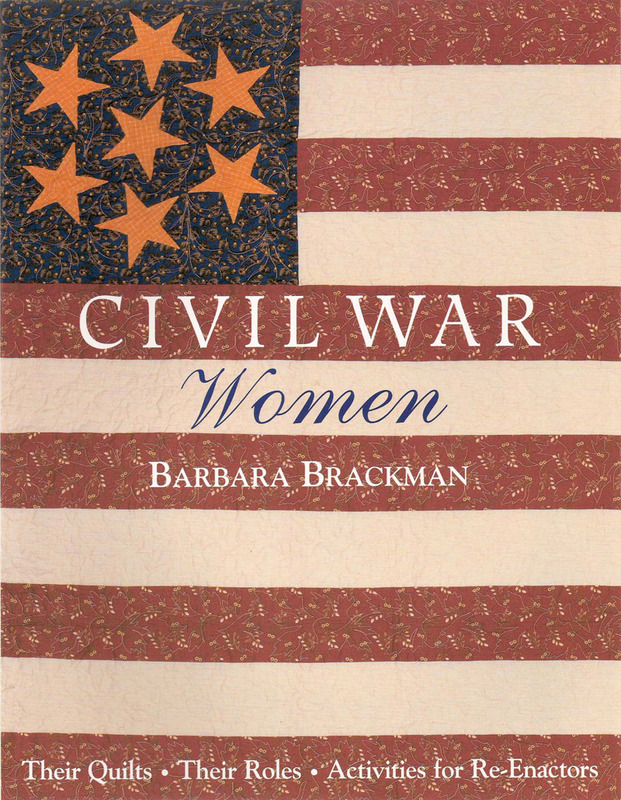 They then returned to their home, which still stands today, in the country just north and west of a small town called Oak Grove Missouri. Thank you for doing this each week. 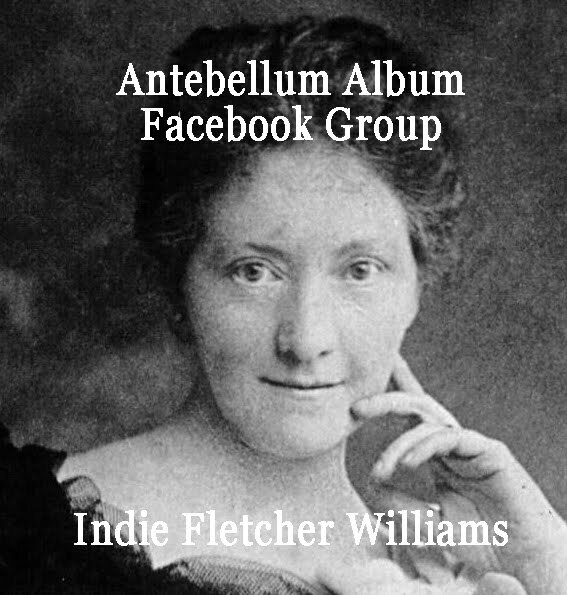 The stories are great and I appreciate the time and effort that goes into this project! 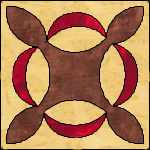 I love applique so this block will be fun! I am unable to print this out successfully. Can someone please help me out? I do not use Adobe Acrobat, but another PDF program that I was finally able to print out the last template, but now not this one. Is there possibly another, easier way to capture this template? Another printing option is to click on Becky's block at the top of the page. Then print preview on your computer. Adjust the size by going to Custom Size and typing in 220% (that's what worked for me-a different size may work for you). If it's over to the side then adjust the hash marks at the top that determine the margins. Print it out. It's a pattern. Thank you very much for your alternate directions below. I was able to print out the pic, but I have no way of knowing if it is the correct size. Without changing anything (like the %), the big center piece came out approx 5.25" wide. Is that correct? The picture just has to fit into an 8" block. If it's too big reduce the printing size. 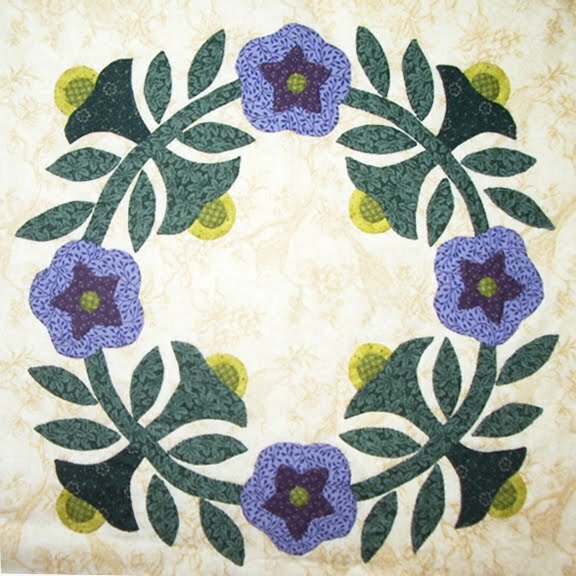 I loved seeing this block as it was the same block I appliqued when taking an applique class from Jeanna Kimball. The back basting applique method has taken me from being a non-applique person to one who really enjoys it. Thanks for this blog, the wonderful history as well as the weekly blocks. 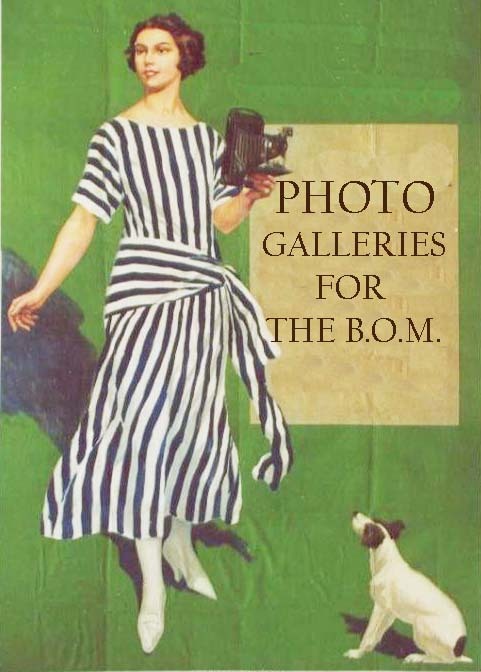 I think it should be made clear that George Caleb Bingham (the man who painted the famous picture "Order No. 11" illustrated here) was no Confederate. He served as a Unionist in the K.C. home guard and as Treasurer of the State of Missouri under Unionist Governor Hamilton Gamble until 1865. He always maintained his love for the Union and his anti-secessionist beliefs throughout his life. 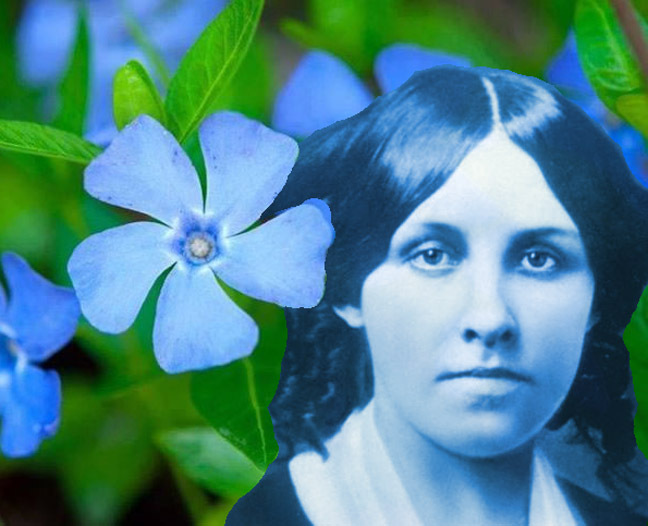 His painting is not "partisan" or pro-rebel, in the way Caroline Abbott Stanley's "Lost Cause" novel "Order No. 11: A Tale of the Border" is. The artist objected to abuses of Civil Liberties on all sides. 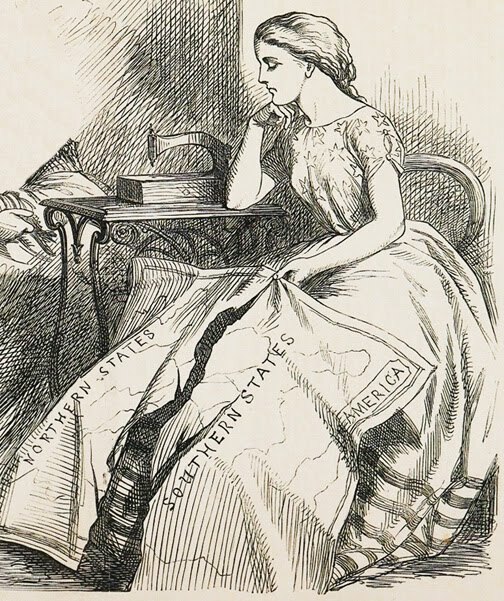 Mattie Bingham, who was his wife for just over a year (1878-79) had been a Southern sympathizer, and by the time she married the artist, he was a reconcilliationist. He nevertheless never denounced his love for the Union or his pride in having to helped preserve it. 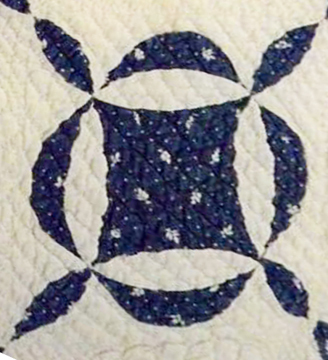 I've made this "Virginia Reel" doing needle turn (by hand) and found the easiest method of basting the piece on the fabric is to machine stitch the applique using 10 stitches per inch at 1/4" in from the edge. By doing this you are literally creating a perforated line in which to FOLD the edge after you've "picked" out bits of the machine basting thread (about an inch at a time). And the perforation line is on the bottom fabric (under the applied applique) and it is an exact guide to line up the applique. That's because the machine stitches mirror each piece. I pretty much do this every time I hand applique or needle turn. 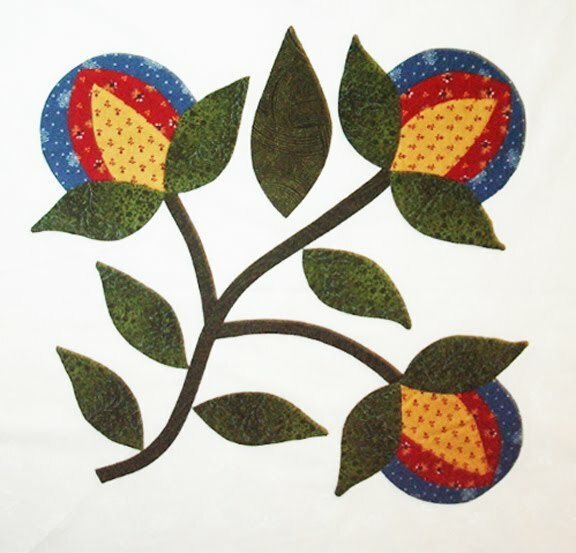 It's an extra step to take but the results are a flat applique piece that is uniform with each and every block. I hope is haven't confused anyone with my explanation.